There's a nice character tease in the trailer over at Game Informer. 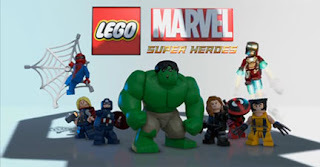 Lego Galactus is casting a large shadow as the devourer of brick-worlds on a handful of the Marvel Heroes. Perhaps it's teasing us with the final boss? I hope we get some heroes from places off planet- Silver Surfer, Nova, etc. Maybe it'll have a galactic sized bonus level. Amazon = A $10 credit. I haven't read anything about bonuses for the Wii U, 3DS, or Vita versions.